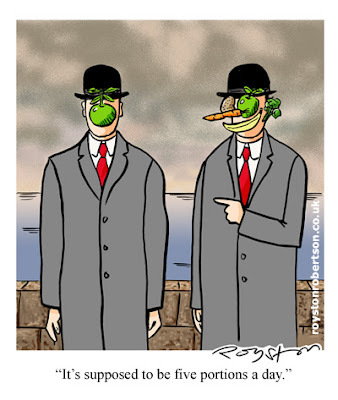 Royston Cartoons: Magritte cartoon: But is it art? I had to explore a few new Photoshop techniques to colour this cartoon, which is in the new issue of Prospect magazine, in an attempt to make it look something like the Rene Magritte original. This cartoon is in the same issue. ha ha! 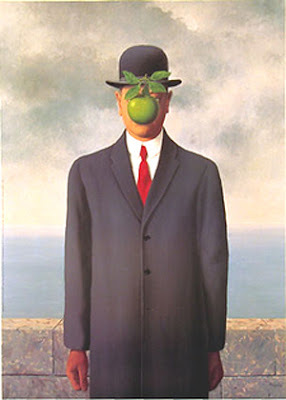 the magritte gag is bloody excellent, nice work! Thanks Will. It waas another one of those where I wasn't too sure about it when it was a rough in my sketchbook, but once I started drawing it up, and realised that the five portions could form a comedy face, I was away! 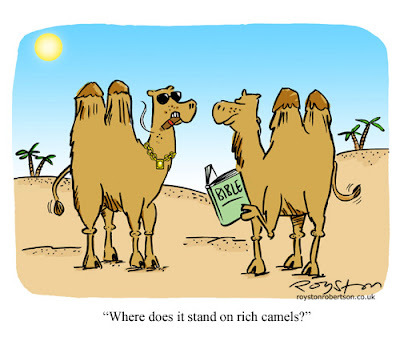 Well done for drawing camels(funny gag too) Horse, camels and donkeys I find the hardest creatures to draw. Any tips? I can draw snakes, fish and cats. There's only one tip for drawing anything these days: Google Image Search. These are really funny - I LOL-ed for real! Had a quick gander at Prospect in Tesco's and saw these two. Both excellent 'wish I'd though of it' gags. Bravo!